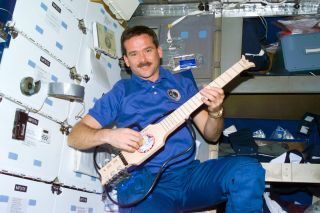 On his first spaceflight in 1995, Chris Hadfield toted a foldable SoloEtte guitar to the Mir space station. He plans to perform on the ISS with a Larrivée Parlor acoustic guitar. After years of leading his fellow astronauts in Christmas carols on the ground, Chris Hadfield will be playing holiday tunes this year on the International Space Station. The Canadian astronaut will blast off toward the station Dec. 19 to join the Expedition 34 and 35 missions. He will spend the next five months, including the festive season, in space, separated from his family. Hadfield will also be away from Max Q and Bandella, the two astronaut bands he belongs to that occasionally do gigs in Houston. At Christmastime, Hadfield and his crewmates will enjoy a festive dinner in space, likely with turkey and gravy for the main course and peach ambrosia for dessert. "We will do the best to host a traditional Christmas kind of dinner," he said during a preflight press conference Tuesday (Dec. 11), telephoning from his quarantined room at Kazakhstan's Baikonur Cosmodrome, where a Russian Soyuz rocket is being prepared to launch Hadfield and two crewmates next week. He added that the diversity of nations represented on the space station never guarantees a holiday will be celebrated by all, due to the workload that needs to be accomplished. But Christmas is recognized by most of the space station residents this time around; the Russian cosmonauts, who celebrate Orthodox Christmas in January, have agreed to join in on Dec. 25 as well. While music will have a festive use around Christmas time, Hadfield expects to use tunes as a tool to boost crew morale throughout his five months in space. Hadfield will assume command of the space station during Expedition 35, becoming the first Canadian to do so. He's spent brief times on space stations before, having visited Mir and the ISS during his shuttle missions. This time, when he takes the helm, Hadfield said the health of the crew will be his primary focus. Music, he pointed out, is a way to celebrate the good times and to mark the bad times. "Music is just an expression and the extension of life itself," he said. Hadfield talked with his crewmates about how they will proceed if a loved one dies on Earth — "my worst fear." He previously served as part of the support team for American astronaut Dan Tani, whose mother died in a car crash in 2007 while Tani was in space. Hadfield wanted to ensure a procedure is in place if tragedy befalls one of his crewmates during the upcoming mission. "That would be extremely hard to deal with psychologically, for the whole crew," Hadfield acknowledged. But with the procedures set, he's hoping the worst doesn't happen, "touch wood." Much of Hadfield's time will be taken up in work while he's on the orbiting lab. There will be an estimated 130 scientific experiments being performed on board, each with a set of tasks and goals that require astronaut assistance. Among them is a Canadian experiment called Microflow, an Iron Man-like device that does near-instantaneous blood work on the astronaut guinea pigs. One of Hadfield's notable achievements in spaceflight is extra-vehicular activity — in 2001, he was the first Canadian to do a spacewalk. For the occasion, NASA played Canada's national anthem in space (also a first) and dubbed Hadfield's spacewalking partner, Scott Parazynski, an "honorary Canadian." NASA has no immediate plans to do a spacewalk during Hadfield's upcoming flight — yet. However, Hadfield acknowledged some "pretty intense conversations" are ongoing because of the breakdown of one minor system on station. In the meantime, Hadfield said he's aiming to stay in the best shape possible in case there's a need to go outside. In any case, physical conditioning will be paramount for when the crew comes home and re-adapts to Earth's gravity. And when that happens, Hadfield has one main hope for his crewmates: "When they land on Earth they are inspired to get to the front of the line, and get on that ride again."